Der Dada 3 was released in 1920 by Malik Verlag Publishing in 1920. Its front page shows one of Heartfield’s first photomontages. It is signed John Heartfield mont.. The “mont.” is short for “Monteurdada”. Heartfield preferred the title “mechanic” or “engineer” to “artist”. He often wore workers overalls (Monteuranzug in German) while working on his collages. 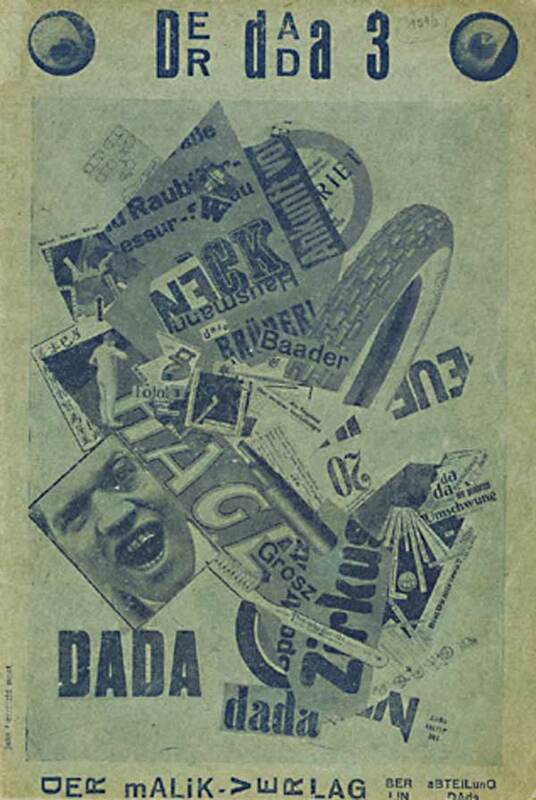 Like so much of Berlin Dada, the artistic, cultural, and political importance of the German Dada Print Journal Der Dada spread across decades. David Bowie expressed his admiration for the Dada movement and traveled to Berlin when he wanted to refresh his creative juices. Modern periodicals and advertising often employ Dada techniques. Der Dada 3 sums up the heart of German Dada. The Berlin Dada artists were courageous, irreverent, sarcastic, and eager to poke fun at their own self-named art movement. The Dadaists were even willing to play games with their own names, the sacred cow of most artists. For example, their list of directors reads: groszfield, hearthaus, and georgemann. That page is dominated by a large protest ad devoted to Charlie Chaplin. “The Int. Dada Company Berlin sends sympathetic greetings to the world best artist and good dadaist. We protest against the exclusion of the Chaplin film in Germany. ADDITIONAL INFORMATION REGARDING CHARLIE CHAPLIN & POLITICS: In 1940, Charlie Chaplin released the highly controversial film The Great Dictator. Chaplin’s thinly veiled depiction of a clownish dictator, sporting a Hitler style mustache, determined to conquer the world in The Great Dictator was a thorn in the side of Adolf Hitler, America’s Time Magazine “Man of the Year” for his meteoric political rise in 1938. During the McCarthy Era (1950s), Senator Joe McCarthy conducted a political witch hunt in the United States Senate. Senator McCarthy accused Chaplin of being a communist. The senator produced a file that supposedly detailed Chaplin’s subversive political activities since 1922. Charlie Chaplin released his film City Lights in 1931. When Chaplin came to Berlin in March 1931 to promote City Lights he was received by a huge crowd of fans. However, he was also received by a crowd of protesting Nazis. In several German cities SA members tried to prevent people from going to the cinema to watch Chaplin’s film. After the Nazis came to power, Chaplin’s films were banned in Germany. At times, John Heartfield and Charlie Chaplin were marked for assassination by Hitler and The Third Reich.